Equi-Stem’s intention is to use the horse’s own MSCs collected from the umbilical cord. This will promote healing by regenerating tissue to re-populate specific cells and tissue after trauma and to bring injured tissue back to its original condition without scar tissue. Because the MSCs derived from Whartons Jelly are young/naïve they have a higher rate of proliferation and can transform into a variety of cell types, and due to their proven methods of expansion, they create a potentially unlimited supply of cells. These new cells can then be used to treat some of the most common early career-ending equine injuries involving nerve, muscle, ligament, cartilage, bone, and tendons. Why Preserve Stem Cells From The Umbilical Cord? Cord tissue refers to the actual umbilical cord and all the cells within it. 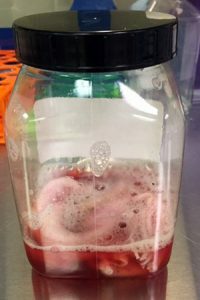 The gelatinous substance in the cord is referred to as “Wharton’s Jelly.” Contained within this jelly are abundant stem cells known as Mesenchymal Stromal or Mesenchymal Stem Cells (MSCs). These primitive/young MSCs are the cells involved in the field of regenerative medicine. MSCs from the umbilical cord are primitive just like the adult cells in both marrow and fat, but the umbilical cord MSCs appear to have a higher proliferative capacity. Research shows the younger cells appear to have greater proliferative potential than similar cells derived from bone marrow, increasing the probability of regenerative success. Studies show that because the MSCs are genetically unique from the foal’s mare, there are no complications or rejection of the stem cells.